The Imbeciles Asylum at Leavesden was one of the first institutions erected by the Metropolitan Asylums Board which had been set up in 1867 to administer care for certain categories of the sick poor in metropolitan London. The MAB's initial plans comprised new smallpox and fever hospitals at Stockwell, Homerton and Hampstead, together with asylums for "quiet and harmless imbeciles" at Leavesden to serve the north of the capital and at Caterham to cover the south. Each institution has its own management committee which received nominal direction from the MAB. 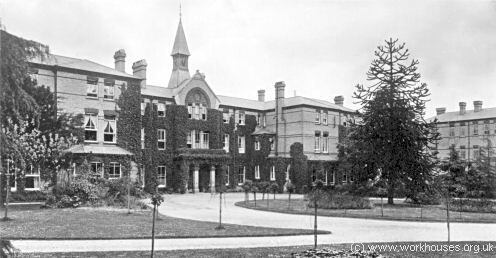 The Leavesden asylum was situated to the north of Abbots Langley, at the north side of what is now College Road (previously Asylum Road). The 76-acre site cost about £7,600 (£80 an acre) and the new buildings, furniture, fittings etc. around £145,600. Architects' design for proposed Caterham and Leavesden Asylums, 1868. The asylum's foundation stone was laid on 31st October 1868 by William Henry Wyatt, J.P., Chairman of the Asylum's Management Committee. There were problems during the construction and at one time the workmen stood idle because the supply of bricks was so low. In April 1869, the contractors, Messrs. Nicholson & Herbert were required to speed up the work under threat of a penalty clause. By June, a new contractor, William Henshaw, had taken over to complete the building, erect the gas works, water and sewage systems, and lay out the gardens. The site had no mains water so a well was dug, 612 feet deep and 10 feet in diameter. Together with side-borings into the surrounding chalk, this provided 100 gallons a minute. However, problems with the pumps were not finally sorted out until 1872. 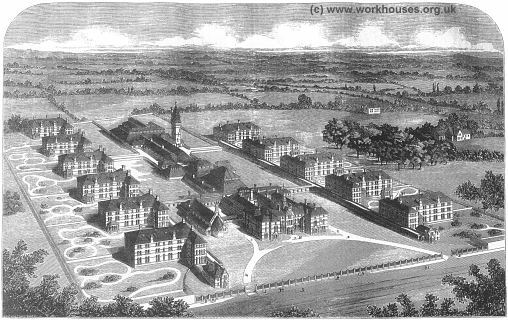 By March 1870, advertisements were being drawn up for staff for the new institution. For Male and Female Attendants, laundry maids, kitchen maids, and cook, the only requirement was being able to read and write. The Workmistress had to be 'capable of superintending the female patients employed upon needlework and also qualified to act as organist in the Chapel". The Assistant Medical Officer had to possess 'double qualification according to the regulations of the Poor Law Board, and be required to do such dispensing as may be necessary'. The Chaplain 'must be in priest's orders and hold license from the Bishop of the Diocese' (Diplock, 1990). Salaries ranged from £13 a year for kitchen/laundry maids, to £15 for Ordinary Female Attendants, £25 for Ordinary Male Attendants, £40 for the Male Head Attendant, £60 for the Inspector, £150 for the Assistant Medical officer, £200 for the Chaplain, and £500 for the Medical Superintendent. Staff were expected to reside on the premises and their salaries included board, lodging, uniform and washing. For those off-site, an allowance was given to cover rent, coal, gas, milk and potatoes. 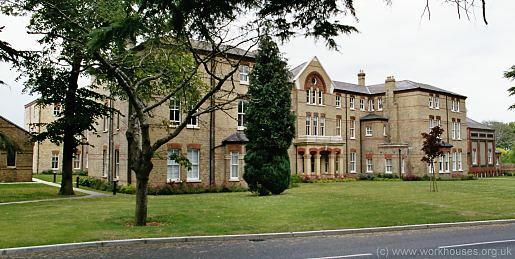 The initial stock of bedding, linen, and patients' clothing for Leavesden was made at Colney Hatch Asylum where the Steward was paid £250 for the extra work involved. 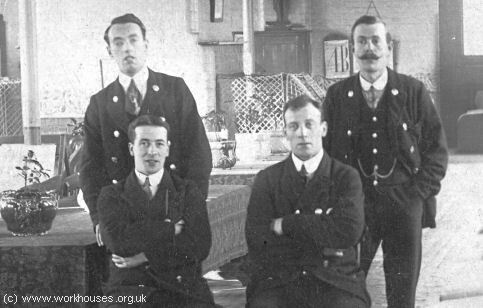 Coldbath Fields Prison supplied the male attendants' uniforms, as well as baskets, mats, and 40 tables at 3s.9d each. The asylum was officially opened on Tuesday 27th September, 1870. The Bishop of Rochester preached a sermon in the chapel, then led procession through the main corridors of the building, and consecrated the cemetery. Afterwards, the guests partook of 'an excellent déjeuner'. The institution admitted its first patients on 9th October, 1870. At a Committee meeting a week later, Dr Shaw reported that 100 were now in residence but, due to problems with the gas tank, no gas was available for lighting or cooking. (Mains electricity was not installed until 1931, although steam-driven generators were in use in 1926). By 14th April 1871, all the female wards were full, and by October there were 739 and 899 female patients. To cope with the numbers, storerooms on some wards had been converted to bedrooms. In December, 1869, Mr E Buckingham appointed as gardener at 25s. a week 'to crop the Kitchen Garden and ensure a supply of vegetables for the Inmates. The following year, cows, pigs, and horses were purchased. Mr Buckingham continued to manage the gardens and farm until 1884. In 1879, 64 patients were employed in garden and farm work. In 1874, the Medical Superintendent, Dr Shaw, visited the Prestwich and Whittingham Asylums to investigate the methods in use there to treat epilepsy. As a result, two dormitories were set aside for patients with this condition (around 30% of the total). The central divisions of these wards were lowered and extra staff deployed. This resulted is fewer casualties from fits and, by 1898, no mechanical restraint or seclusion were required. Patients at Leavesden who were capable of working were taken, under strict supervision, to various working areas. Women worked in the laundry, needleroom, and female staff quarters. Men worked in the gardens, on the farm, in the shoemaker's, tailor's, upholsterer's and paint shops, and in the laundry kitchen and bakehouse. 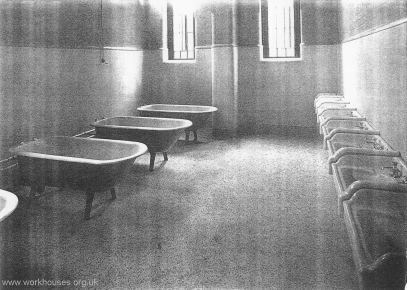 Patients who were unsuitable for these jobs were employed on the wards, scrubbing and corridors and stairs. Patients' clothing was made on the asylum premises: men's corduroy suits in the tailor's shop, and women's dresses in the needleroom. Neckerchiefs were issued to the men, and shawls and bonnets to the women. 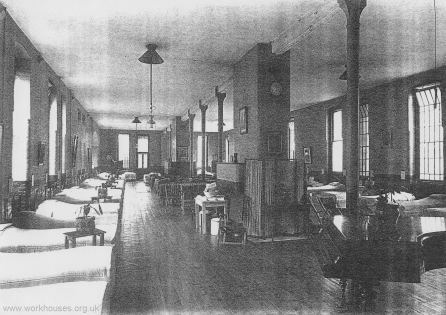 At night, all clothing was taken out of the dormitory and kept in a room at the end of the ward. The men wore day shirts and vests at night. Recreation was considered an important part of the patients' life and in October, 1870, £15 was provided to purchase playing cards, bagatelle and draughts boards. An annual grant was made for a staff and patients' library, and pianos were bought for some wards. An asylum band entertained patients at a weekly dance. In 1884, the Medical Superintendent, Dr Case, pronounced 'the use of tobacco absolutely necessary in the treatment of the insane' and smoking was allowed. In 1891, a recreation hall was erected at the east of the administrative block. In 1876, a Turkish bath was installed, using hot air from the adjacent laundry. It was for the use of both staff and patients, but was to be used only on Sundays and Wednesdays. The Medical Superintendent reported that it would 'be of a great advantage to the Staff, especially the Female portion, who suffer to a large extent from biliousness consequent on their restricted and somewhat repressed life'. Discipline in the asylum was, however, strict both for patients and staff. The sexes were strictly segregated, apart from the weekly dance and chapel service — even then, men sat at one side, and women at the other. Staff were not allowed to mix in the grounds or even talk over a fence during off-duty periods under threat of dismissal. The staff day-duty ran from 6am until 8pm with 1½ hours off for meal breaks. Sub-officers were allowed one day's leave every four weeks. Male attendants were expected to salute Medical Officers as a sign of respect. Even senior officers were not exempt from the rules. The Medical Superintendent and Matron were reprimanded for visiting each other's quarters. Even the Chaplain was reported for breaking the rules by jumping over the fence to his house rather than going out by the front gate as was required. 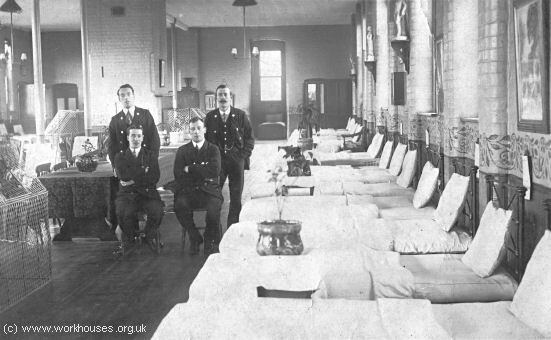 Leavesden ward interior and attendants, 1907. Leavesden ward interior and attendants (detail), 1907. 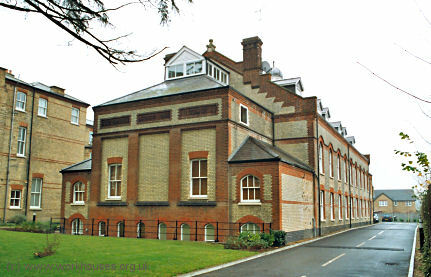 Later additions to the buildings included a new mortuary at the north of the men's side in 1902, an isolation block at the east of the porter's lodge in 1903, and nurses' home in 1904 at the north of the female side. In 1913, partly to provide open air space for TB patients, and also to serve as fire escapes, bridges were built between adjacent pairs of pavilions. The site layout in 1923 shown on the map below. From 1920, the asylum became known as Leavesden Mental Hospital. In 1929-31, a major scheme of updating and improvements was undertaken, including the installation of a mains electricity supply to the site. In 1930, while the refurbishment was still in progress, administration of the hospital passed to the London County Council. In April, 1932, the former St Pancras Industrial School immediately to the south of the hospital was taken over as an annexe for chronic cases. 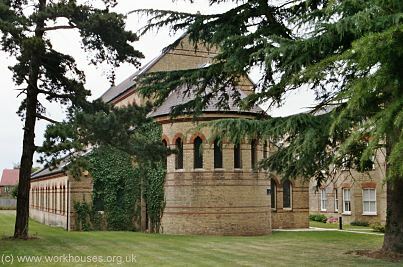 The annexe served as an Emergency Hospital during World War 2 and all the existing patients moved to the main site where even the chapel was pressed into use as ward accommodation. With the inauguration of the National Health Service in 1948, Leavesden continued to provide care for the mentally handicapped under the control of the North West Metropolitan Regional Hospital Board. The hospital finally closed in 1995 and the site has now been redeveloped for housing. Most of the hospital buildings have been demolished with the exception of the administrative block, chapel, and recreation hall.